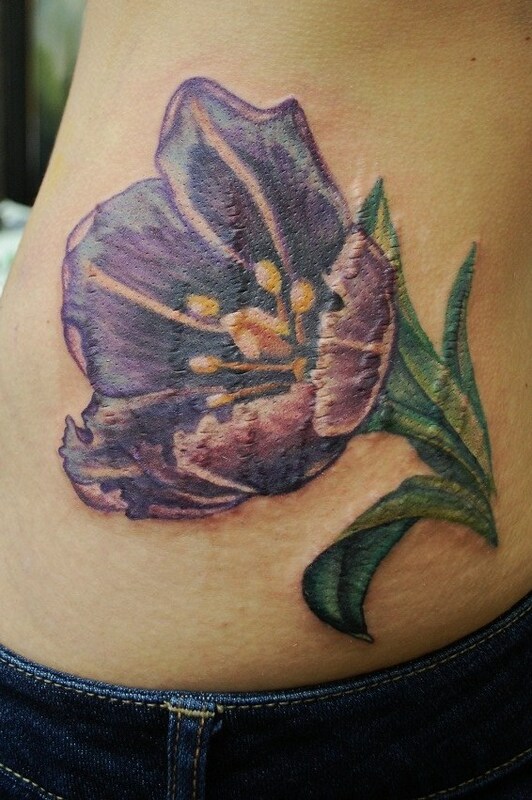 I had the chance to do a purple tulip today. I LOVE these flowers. So much. She had a few stretch marks- she has been losing weight. Right now, in this picture, the tattoo is fresh and so they appear raised a bit, but when it heals they will be barely noticable. Stretch marks are easy to cover with tattoos, as long as the tattoo subject itself has some texture- like a flower, a branch. Something with varying contrast and color. She sat like a champ, and her friend (one of my regulars) brought me some chocolate-marshmallow-peanut fudge stuff which is AMAZING. After this I did a smaller piece on a good friend.